3 Oz. Tomato Juice "Blood"
Mix the tomato juice, chipotle sauce, Tabasco and Worcestershire sauce together then freeze in a container to a 1/2" thickness. When your tomato "blood" is frozen solid smash it into chunks and set back in the freezer until you're ready to construct your drink. The frozen "blood" will form a platform for your Skull Shooter. Rim your skull glass with lime juice then dip in the kosher salt and chill in the freezer. Fill the 2 pipettes with fresh lime juice. Add your tomato "blood" to your chilled glass. Settle your Skull Shooter onto the "blood" platform and fill with the chilled Patron. Gently pour the ice cold beer around the shooter. 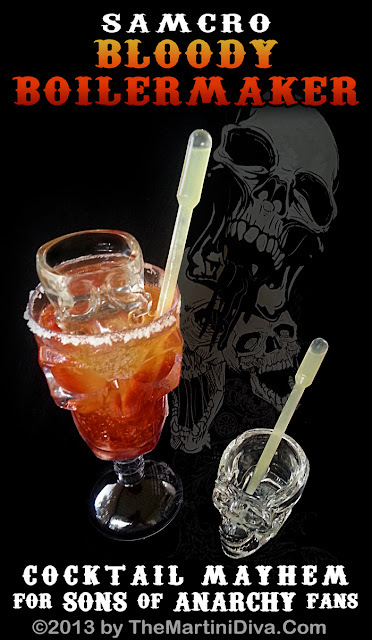 Fill the second Skull Shooter with more Patron and slide in the second lime filled pipette. Sit back to enjoy SONS of ANARCHY!